One Girl Scout year is winding down, as another is about to begin in full force. 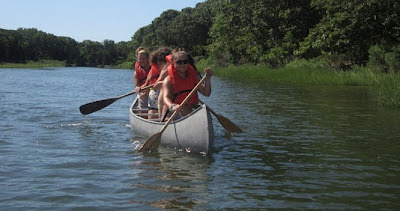 While Association Award Events ended their course as of June 25, Day Camp is just beginning, and the first Residence Campers at Blue Bay will arrive next week! At the Girl Scout Service Center staff are preparing for short-term summer programs for girls that will be delivered at various locations. Some Troop and groups will continue to meet over the summer, and the Girl Scouts of Nassau County Chorus -- on the heels of their successful performances in June in Washington, DC and Niagara Falls -- has July gigs on Fox and Friends, a national TV morning show, on Independence Day and with the NY Mets at Citifield on July 7. We bid a fond and happy retirement to Pat Amoroso after 15 years of staff service. We welcome summer interns and we are already planning for a new staffing delivery system that will be ready to roll in September, in conjunction with our heightened focus on our Strategic Priorities. And, we are preparing new ways to ensure our Entrepreneurial Programs are ready to deliver on our brand promise to teach girls the "5 Skills." -- Phew! Lots of work, lots of activity, lots of change. We're open all summer – come visit us! When you think of female movie characters, which is the first one that comes to mind? Is she a leader? Is she over the age of 40 and does she have a minority skin color? If your answer to any of these questions is “No,” it’s not surprising. According to a recent study from San Diego State University, it is very uncommon to see a female movie character who exhibits these characteristics. Through the ToGetHerThere Cause, Girl Scouts USA is encouraging today’s girls to become tomorrow’s leaders. Click here to see how Girl Scouts is encouraging girls to close the pay gap, enter STEM careers, and much more. Here are some highlights of the findings from the San Diego State University study. For the full study, go to http://www.wif.org/images/repository/pdf/other/2011-its-a-mans-world-exec-summ.pdf. Only 11% of all clearly identifiable protagonists are female, 78% are male, and 11% are male/female ensembles. Male characters are much more likely than females to be portrayed as leaders. Overall, male characters account for 86% and females 14% of leaders. Male characters are more likely than female characters to be identified by their occupational status. Female characters are more likely than male characters to be identified by their marital status. 60% of male characters have unknown marital status versus 41% of female characters. Males 40 and over account for 50% of all male characters. Females 40 and over comprise 25% of all female characters. 73% of all female characters are Caucasian, followed by African American (8%), Latina (5%), Asian (5%), other worldly (4%), animals (3%), and other (1%). Moviegoers are almost as likely to see an extra-terrestrial female as they are to see a Latina or Asian female character.